Definition at line 395 of file btrfs_drv.h. Definition at line 413 of file btrfs_drv.h. Definition at line 398 of file btrfs_drv.h. Definition at line 408 of file btrfs_drv.h. Definition at line 397 of file btrfs_drv.h. 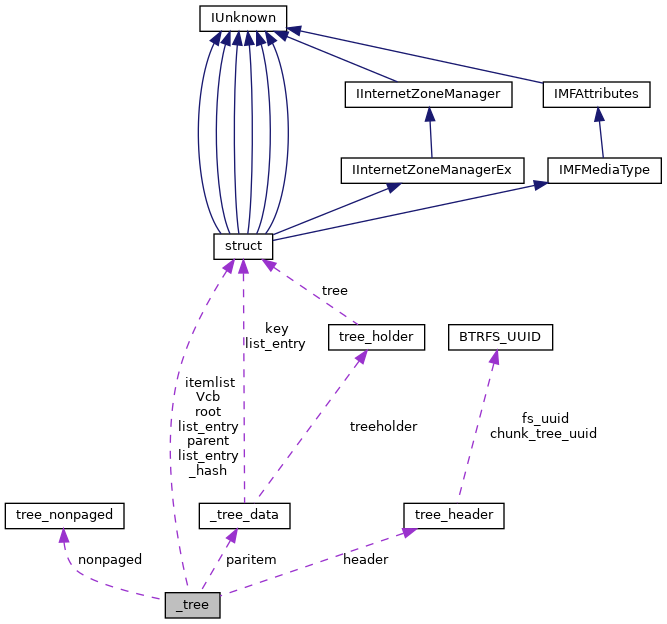 Referenced by free_tree2(), load_tree(), and write_metadata_items(). Definition at line 396 of file btrfs_drv.h. Referenced by _Function_class_(), commit_batch_list_root(), create_root(), data_reloc_add_tree_edr(), delete_tree_item(), insert_tree_item(), skip_to_difference(), try_tree_amalgamate(), write_metadata_items(), and write_roots(). Definition at line 411 of file btrfs_drv.h. Definition at line 404 of file btrfs_drv.h. Referenced by commit_batch_list_root(), insert_tree_item(), try_tree_amalgamate(), and write_metadata_items(). Definition at line 405 of file btrfs_drv.h. Definition at line 406 of file btrfs_drv.h. Referenced by free_tree2(), and write_metadata_items(). Definition at line 407 of file btrfs_drv.h. Definition at line 401 of file btrfs_drv.h. Referenced by do_splits(), find_next_item(), find_prev_item(), free_tree2(), next_item2(), skip_to_difference(), try_tree_amalgamate(), and write_metadata_items(). Definition at line 402 of file btrfs_drv.h. Referenced by commit_batch_list_root(), do_splits(), insert_tree_item(), next_item2(), skip_to_difference(), and try_tree_amalgamate(). Definition at line 403 of file btrfs_drv.h. Referenced by do_splits(), next_item2(), skip_to_difference(), try_tree_amalgamate(), wine_rb_clear(), wine_rb_get(), wine_rb_init(), wine_rb_put(), wine_rb_remove(), wine_rb_rotate_left(), and wine_rb_rotate_right(). Definition at line 399 of file btrfs_drv.h. Referenced by commit_batch_list_root(), delete_tree_item(), insert_tree_item(), and try_tree_amalgamate(). Definition at line 412 of file btrfs_drv.h. Definition at line 409 of file btrfs_drv.h. Definition at line 400 of file btrfs_drv.h. Definition at line 410 of file btrfs_drv.h. Referenced by add_root_item_to_cache(), allocate_cache_chunk(), commit_batch_list_root(), delete_tree_item(), insert_tree_item(), and try_tree_amalgamate().